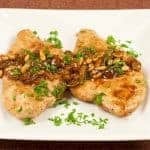 Balsamic vinegar combines with golden raisins and toasted pine nuts to make a sweet-savory sauce for pan-seared, boneless chicken breasts. Place the raisins in a small bowl and cover with boiling water. Allow to soak for 10 minutes, then drain and set aside. If your chicken breasts have tenderloins attached, remove them and reserve for another use. Place the breasts between 2 sheets of plastic wrap and gently pound to an even thickness of about 1/2-inch. Season both sides of the chicken with salt and pepper, dredge in flour and shake off the excess. Heat 2 tablespoons of the olive oil in a large pan over medium-high heat. Add the chicken and cook until golden on the outside and no longer pink in the middle, 2-1/2 to 3 minutes per side. Transfer to a plate and cover loosely to keep warm. Add the remaining tablespoon of olive oil to the pan along with the pine nuts and cook until they are lightly toasted, 1 to 2 minutes (watch carefully). Using a slotted spoon, transfer to a bowl and set aside. Reduce the heat to medium, add the garlic and sauté until barely golden, 1 to 1-1/2 minutes. Add the chicken broth, balsamic vinegar and raisins bring the mixture to a simmer. Continue cooking until the liquid has reduced slightly, about 2 minutes, then return the chicken to the pan. Turn the chicken breasts several times to coat them with sauce, then transfer to a serving platter. Add the pine nuts to the sauce, stir to coat, then spoon the mixture over the chicken. Sprinkle with fresh parsley if desired.